The Samsung AX5500 is a good air purifier capable of delivering clean air in just about 45 minutes of run time. While it comes with a complete set of required features, it lacks in IoT/app compatibility, something one would expect it in a device that costs Rs 33,490. 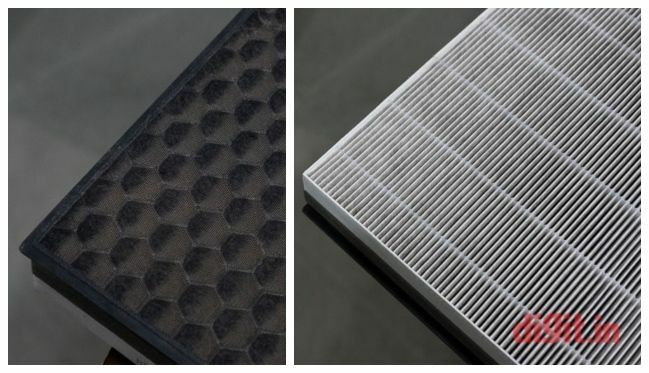 The company has also made filter replacement easier by combining an activated carbon filter with a HEPA filter and with filter life of over 8000 hours, one doesn’t need to worry about the only major recurring cost of an air purifier. If you want to buy a high-performance air purifier and have no problem with missing IoT features, then the Samsung AX5500 is a worthy purchase. 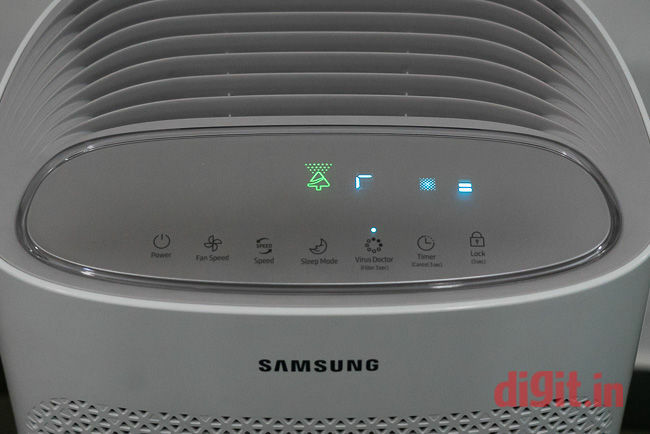 Samsung launched its AX5500 air purifier in October, right around the time when air pollution levels were rising across India. With its new device, the company has made sure that all necessary requirements are met to filter out the harmful particulates in the air and it is also equipped with a carbon filter to eliminate harmful gases. One of the most challenging issue for any air purifier manufacturer is to develop a product capable of circulating clean air evenly in a room. Samsung engineers had a rather unique, three-way airflow approach in doing so with its new air purifier. However, we will test whether the air purifier performs as it should or not. The Samsung AX5500 is an air purifier, which is bound to be noticed due to its fairly large size. It looks almost like a semi-tower fan that might not blend in with the decor of your home but that doesn’t mean that it’s not designed well. The device’s body is constructed out of ABS plastic, which is durable and won’t break if it accidentally bumps into the walls. However, the device is supposed to be kept in one place and as long as it’s moved around inside a house, its durability doesn’t need to be a concern. Samsung has fit wheels on the device as well, making it easier to move it to another room in your home. This is definitely a good addition to the device since the AX5500 weighs 11.6kg. 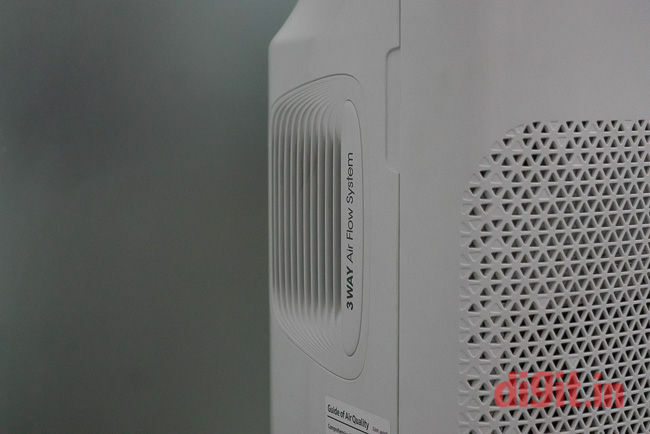 The air purifier’s air inlet on the front and the entire front panel can be removed to reveal the filters placed inside. This panel attaches magnetically to the device’s main body and is easy to remove and snap back again. There are three air outlets from where the device expels clean air, one on top and two on each side. Making sure that a device circulates clean air evenly in a room is a challenge for air purifier manufacturers but the Samsung AX5500 tackles this problem in a rather unique way. The one on the top pushes out the maximum amount of clean air and while the two side outlets are relatively smaller, they too direct clean air at a considerable rate. The combined result is that air is pushed in three directions with considerable force, preventing the formation of the small air bubble that Air Purifiers are normally prone to. In summation, the design of the Samsung AX5500 is similar to what we have seen in a majority of air purifiers. However, it features some minor additions and tweaks that add functionality to a rather vapid design. Do note that the design of an air purifier matters to a great extent, not for aesthetics, but primarily for ensuring good performance. This is because a device’s design plays a big role in ensuring proper airflow, which results in clean air circulation and healthier air quality. This holds true for all air purifiers, but is only one aspect of various things that influence the performance of an air purifier. The filter on Samsung AX5500 is a combination of an activated carbon filter and a HEPA filter. This is the same configuration we saw on the Blueair Classic 280i and it definitely works well, depending upon the implementation. A combined filter can be as efficient as two standard separate filters and it also proves to be less of a hassle when it’s time to get a replacement. 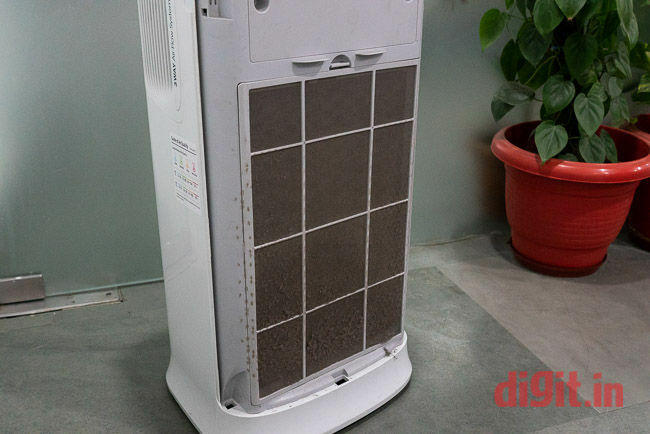 Additionally, in its combined filter, Samsung choose to place the carbon filter before the HEPA filter, which is a smart decision as the carbon filter lasts much longer in comparison to a particle filter. The AX5500 features a pre-filter that traps dust, pollen, pet dander and other larger particles. The only hassle here is of cleaning it once every two weeks or so depending on what kind of pollution is prevalent in your area. We used the air purifier continuously for around a week, after which the pre-filter was choc full of dust, hair and pet dander. This is a good sign that the pre-filter is working as intended and prolonging the overall life of subsequent filters. One thing to note is that the area where filter is placed forms a tight seal. This means that the purifier’s efficiency goes up since there is no air circumventing the filters. Replacement filters cost Rs 4,990 but this seems to be a fair price considering that the device’s filters last for more than 8500 hours. However, this number will vary depending upon how polluted the air is, inside your home. Getting down to brass tacks, we tested the Samsung AX5500 air purifier in three different areas that have relatively varying levels of air pollution. Do note that this device was tested right after Diwali and in Delhi, when the pollution levels peaked above the Severe category. Room 1 is the first area where we tested the device and it has an area of 120 sq ft with a ceiling height of 12 ft. This room is situated in an area where the external pollution levels are quite high and there’s construction work going on nearby. Room 2 is in an area where pollution levels vary between poor and moderate, and it’s also regularly dusted and kept clean. Its ceiling height and area are 12 ft and 140 sq ft respectively. Room 3 is one of the conference rooms in our office, which usually has lesser indoor pollution and potted plants are also kept inside. The ceiling height is 12 ft and it has an area of 350 sq ft. Do note that even though Samsung’s air purifier has sensors and shows the current PM2.5 levels, we used an air quality monitor to independently check how well the air purifier performs. Do note that we recorded the concentration and not weight of the PM2.5, PM10 pollutants, and these are listed in µg/m3. We first tested the device in room 1 and saying that initial particulate levels were past permissible levels would definitely be an understatement. Before commencing our standard 45 minute run of the air purifier, the PM2.5 and PM10 levels were 519 and 623 µg/m3 respectively. As per the National Ambient Air Quality Standards, permissible particulate levels (over 24 hours) for PM2.5 is 60 µg/m3 and for PM10 is 100 µg/m3. If a healthy individual is exposed to such high levels of air pollution for a long period of time, they are at a high risk of developing lung and/or coronary complications. 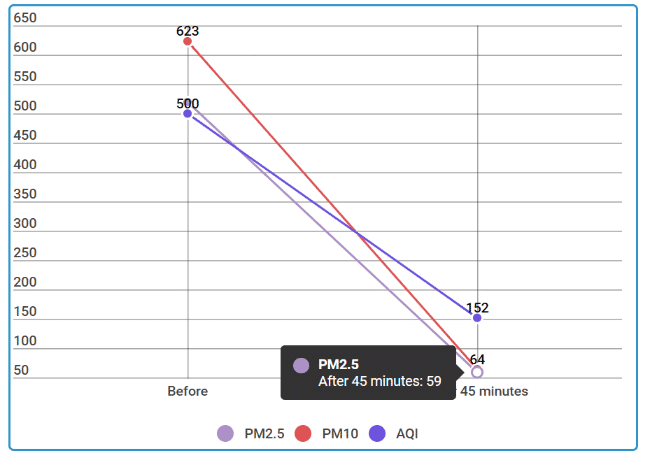 Coming back to the testing, we ran the air purifier on max speed setting for 45 minutes and noted that it was able to bring down the PM2.5 levels to 59 and PM10 to 64. The AX5500 did a commendable job in improving the extremely degraded air quality levels because around the same time, we also tested a few other air purifiers that failed in lowering the particulate count within acceptable levels. The air quality was down more than we expected while conducting the test in room no. 2, which is usually moderately polluted. In a total runtime of 45 minutes, the device brought down PM2.5 levels to 25, down from 304 and PM10 levels were at 27, down from 370. Once again, the Samsung AX5500 exhibited impressive performance and quickly restored good air quality in the room under a short amount of time. Room no. 3 is our own conference room where we test every air purifier. It is quite clean and there are very few elements in the room that can contribute to an unexpected rise in the pollutant levels. Before starting our test, the PM2.5 reading was at 128 while the PM10 levels were 147. After running the air purifier, the PM2.5 count was down to 11 and PM10 to 12. Overall, after testing the Samsung AX5500 in such elevated levels of air pollution and assessing its performance, it’s safe to say that the device is a commendable performer. It makes good use of the three-way airflow system and is capable of bettering air quality even on days when the air pollution is severely high. For some reason, Samsung missed on the opportunity to introduce an IoT enabled device with the AX5500 air purifier. The device does not come with any sort of IoT features or even app compatibility, which leaves much to be desired. In this day and age, not having a smart air purifier is definitely a letdown, unless the device has some other mechanism that’s as good as having IoT support. Unfortunately, the Samsung AX5500 doesn’t come with any such features, except for Auto Mode. We will get to the auto mode in a bit but before that, let’s go over the air purifier’s controls. It would have been nice to be able to turn the air purifier on an hour before getting home so that we could enter our respective homes to cleaner air. The controls to use the air purifier are right on top of the device. It features touch-enabled buttons for turning the device on and off, Fan Speed control, Sleep Mode, Speed Mode, enable/disable Virus Doctor, Timer and Lock. While most of the controls are self-explanatory, the fan speed of the device can be varied between four different levels, high, mid, low and Auto. 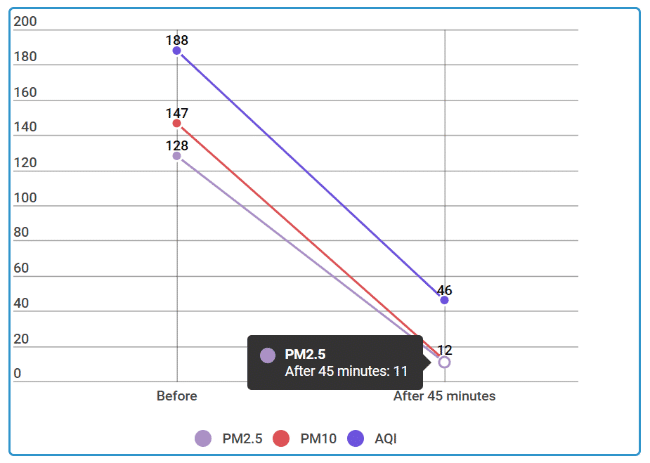 Once put on auto mode, the device makes use of the PM2.5 and VOC sensor to detect the level of particulates and harmful gases in the air respectively. Once these levels cross a certain threshold, the air purifier’s speed is increased or decreased accordingly. 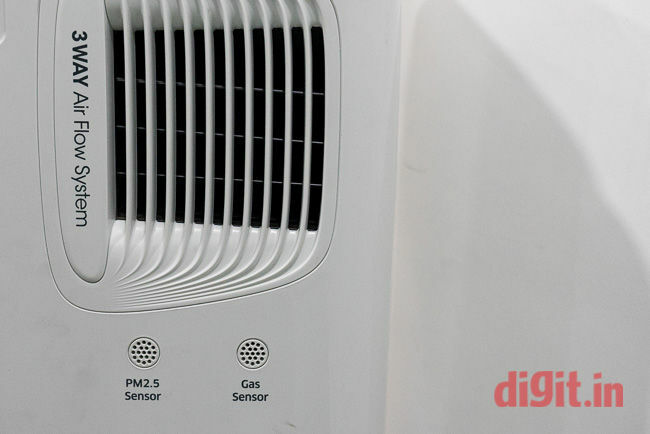 On Speed Mode, the device runs on full speed for 30 minutes and this is done to quickly purify the air in a room. Next up is the Sleep Mode in which the display is dimmed and speed is reduced to minimise noise. This mode is a boon for light sleepers who would be otherwise disturbed by a noisy fan and bright lights. The Timer function enables users to set a timer for how long the device would run before turning off on its own and it can be set for up to 12 hours. There is also a Lock mode, which is activated when its pressed down on for three seconds. Under this mode, the buttons on the device become unoperational and this mode comes in handy if you have kids at your home who like to mess with such devices. Coming to the Virus Doctor option, tapping on it enables the company’s S-Plasma Ioniser technology (SPI). There is also a digital display that shows PM2.5 levels in µg/m3 and indicates the level of gaseous contaminants with four different colour variations. We always prefer a device with a digital display so that one can quickly glance at the pollution levels. The display is sufficiently bright and we had no problems in getting an idea of what the PM2.5 levels inside the room were. One can also get a gist of the air quality with a tree symbol that is displayed alongside the PM2.5 reading on the display. The symbol features four colour variations, Blue, Green, Yellow and Red, on the top panel. On the basis of colour displayed on the device’s top panel, the air quality varies between Good and Bad, with a Blue colour representing good air quality and Red being degraded air quality levels. Except for the lack of IoT functionality, we feel that there’s not any problem associated with the device’s controls. The Samsung AX5500 is a commendable performer that can definitely hold its own when it comes to air purification. 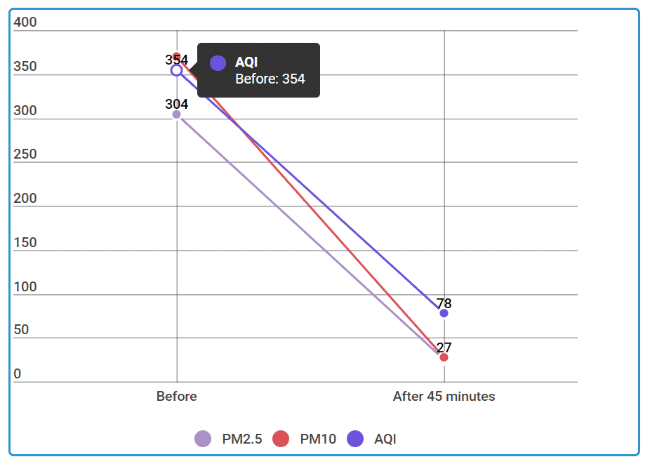 We tested the device during Diwali season, at the time when harmful particulate levels went through the roof and it managed to restore good air quality under 45 minutes. The device performs consistently in areas with varying levels of air pollution and is definitely best suited for areas with high pollution levels like Delhi, Faridabad, Hyderabad and others. In case you want a device that is similarly efficient and offers IoT smarts, you can go for the Blueair Classic 280i (review). There is also the Kent Alps air purifier (review) for those who are looking to buy an air purifier on a budget.